It’s hard to stick to eating healthy when you’re grabbing lunch out every day especially for keto diet beginners still trying to figure it all out. Keto Lunches are so much easier when you meal prep for the week. 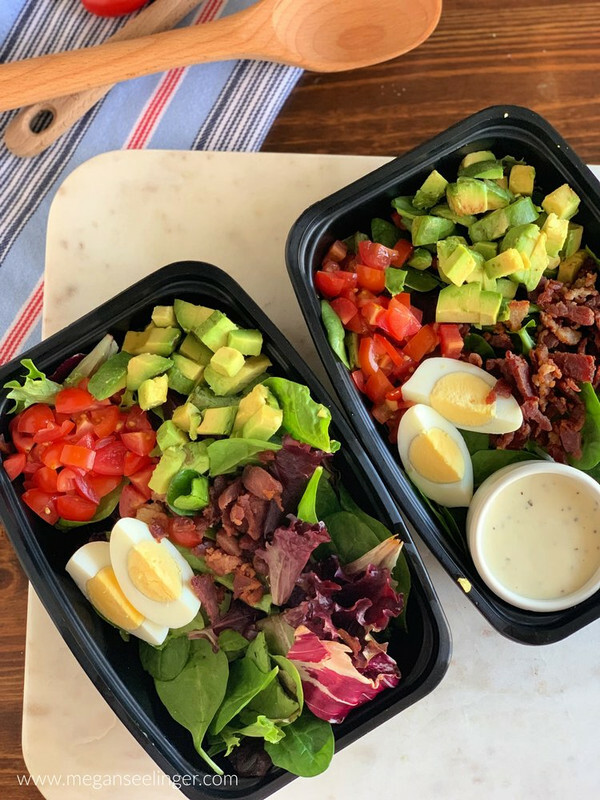 Meal prepping these Keto Cobb Salads is super easy. For starters, you’ll want to cook your bacon. You can either pan fry or bake your bacon. Make sure that you are using Organic Uncured Nitrate Free Bacon. Pan Fry: Bacon cooks better on low and slow! So leave your burner on low/ medium heat, and as the edges start to buckle and curl continue flipping the bacon, so they cook evenly on both sides. We want the bacon to be pretty crispy since we will be chopping it into small pieces. Baking: Preheat oven to 400 F. Arrange bacon on a foil-lined baking sheet. Bake for about 15-20 minutes. 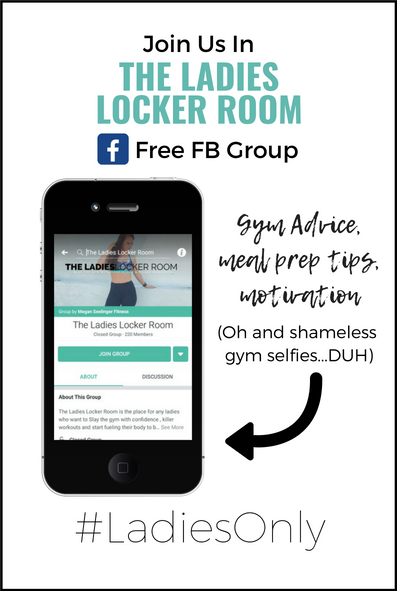 No flipping required! Either way, you decide to cook the bacon be sure to drain off the extra grease and place your bacon in between two paper towels and pat off any excess grease left on them. Now, you will hard boil your eggs. You will need one hardboiled egg for every day that you are meal prepping for. I have had my Egg central steamer for a few years now, and I swear by it. It will hard boil a dozen eggs perfectly every time! Dice up your cherry tomatoes, but I recommend waiting until just before you are about to eat to add the avocado. You can save any leftover avocado in one of these avocado savers. You can grab one for $5 on Amazon here. It will prevent your avocado from getting all brown and yucky in the fridge. Now that you have all the topping prepared you can easily follow the directions below to portion all of your containers of Keto Cobb salad out! I use these BPA free Fitpacker meal prepping containers that I buy from Amazon. They are great because you can freeze them, microwave them , they stack perfect in the cabinet and they are inexpensive so you won’t kill your husband for leaving one at work! When it comes to dressing Ranch is my ride or die lol I could happily put ranch on anything. I prefer Trader Joes Organic Ranch Dressing. 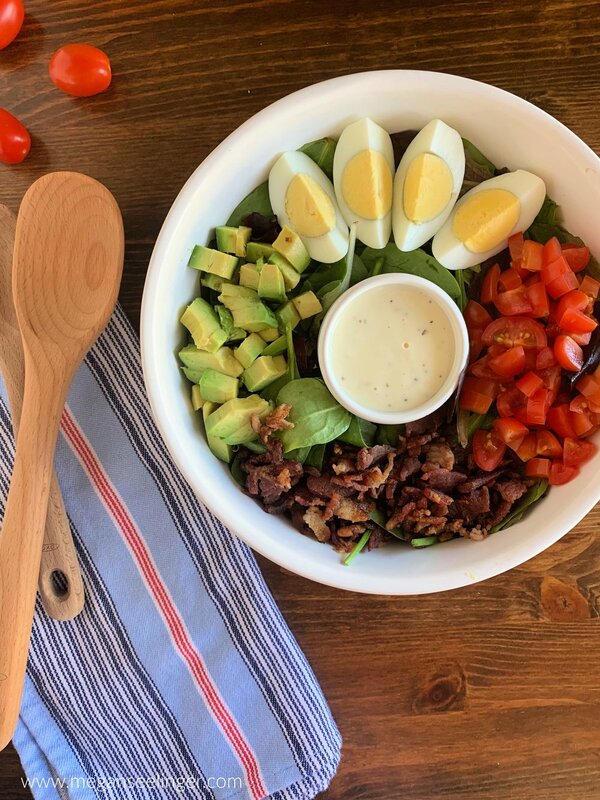 I would keep your dressing on the side, so your Keto Cobb Salad doesn’t get all soggy. Prepare Toppings: dice the tomatoes, Bake or pan fry crispy bacon, Hard boil eggs. Don’t cut up your avocado until you are ready to eat. Set out as many meal prep containers as you intend to prepare. In each container portion out: 2 Cups Arugula and spinach mix, 1/4 cup Cherry tomatoes, 1/4 cup Bacon crumbles, and 1 hard boiled egg. When you are ready to eat top with 100g of avocado and 1 Tablespoon Ranch dressing. Nutrition Facts do not include dressing so you can easily add whatever dressing you prefer.